Some of you will remember the era when the Superbowl halftime show repeatedly featured Up With People. That was around the time when Granny Smiths arrived in our supermarkets and finally gave Americans a third apple, a tart and crunchy alternative to red and golden delicious. Those were simple days. Forty years later, left-shark GIFs and crisp pink honey sweet snow white candy crunch goodness have exploded onto the stage. Red delicious and grannies are still around, but now we can easily find another dozen familiar varieties, along with new name-branded apples streaking up the sales charts: Honeycrisp, Pink Lady ®, Jazz ™, SweeTango ®, Envy™, Ambrosia ™, Opal®, and Kanzi® (the apple, not the 35-year-old linguistically advanced bonobo). As the marks suggest, the production or sale of many of these varieties are controlled to some extent by marketing groups or clubs that actively promote the brands and sometimes control quality. So far, all have been bred conventionally, however a pair of genetically modified varieties were approved this winter (2015), with more likely on the way. Do these new varieties live up to the hype? Read our dramatically spectacular Shakespearean Superbowl edition XLVII to find out. Honeycrisps seem to have shot out of nowhere lately, even though they have been available for nearly 25 years. In many states, its acreage is expanding very rapidly (www.nass.usda.gov), and in 2013-14, it was the 7th best selling variety (usapple.org). The Honeycrisp was bred and developed by the University of Minnesota and had patent protection until 2008, generating millions of dollars for the university in licensing fees. Even off-patent, it’s often more expensive than other varieties – online, Costco charges for Honeycrisp nearly three times what Fuji and Gala cost. Why are people so crazy for an apple that they are willing to pay that much more? I know at least one grower who credits the name, which is pretty much a direct translation of what people want in an apple. But what is the evidence that Honeycrisp apples actually are crisper and juicier than others? A study (done at Honeycrisp’s birthplace, the University of Minnesota) used a panel of 12 tasters, a microscope, and a texture analyzer to compare 10 apple varieties, both commercial and in development (Mann et al. 2005). Some test varieties had Honeycrisp as a parent and were expected to share some of its qualities. Apples were tested fresh and after 4 months of cold storage. When the data came in, Honeycrisp apples (and their progeny) were rated as firmer and crisper than most other varieties, even after 4 months of storage. They were also juicier. In the study, juiciness was related to cell size, and Honeycrisp had the largest cells of the ten tested varieties (statistically larger than most). Larger cells contain larger sugar-filled pockets of water (vacuoles) that burst open when you bite into them. 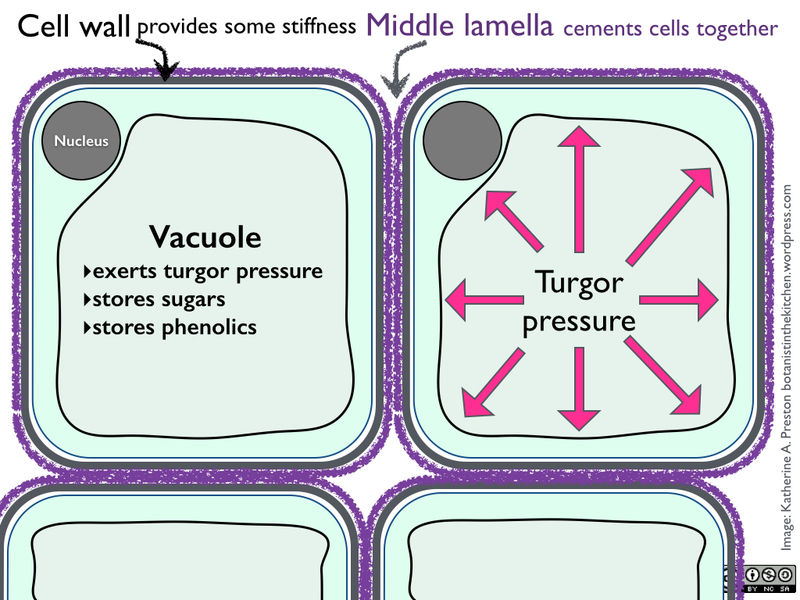 But for pretty much all plant tissues, “crunch” is related to three additional properties: cell wall stiffness, the integrity of the middle lamella, and turgor pressure. Cells of the apple flesh contain a large central vacuole full of water, sugars, and other compounds. The pressure of the water against the cytoplasm (light blue) and ultimately against the cell wall supports the wall and adds to tissue stiffness. The middle lamella keeps cells from sliding apart and feeling “mealy.” Click to enlarge. Turgor is the pressure exerted against the walls of the cells by the water inside of them, and this pressure helps keep the whole tissue stiff. Imagine the difference between standing on a stack of empty shoe boxes (which would collapse under you) and a stack of shoe boxes each containing a large water balloon (which might support you). When you forget to water your peace lily and its leaves droop, it’s because turgor has been lost through dehydration. Similarly, when a slice of fruit starts to dry out, it gets limp because the turgor is not there. Sometimes when apples are stored for a while, they start to lose turgor and they feel softer. Their juice is also under less pressure so they don’t explode in your mouth. Somehow Honeycrisp apples are unusually good at maintaining their turgor pressure over time (Tong et al., 1999). For the turgor mechanism to work, the walls must be stiff enough to resist the pressure. Wall stiffness also contributes directly to tissue firmness. During ripening, enzymes in cell walls tend to soften them, but again, Honeycrisp resists this change and stays firm in storage (Tong et al., 1999; Harb et al., 2012). Stiff walls and turgid cells don’t make a tissue crisp if the middle lamella doesn’t hold the cells together. With a good middle lamella, a fruit can have smaller cells, less turgor, and more flexible walls without feeling mushy and grainy in your mouth. Peaches prove this point. They get very soft when ripe, but they don’t usually feel like an old wool sweater. As long as the middle lamella is holding the cells together, your teeth can break into the cells and release their juices. When that cement has dissolved, the individual cells come apart, and the tissue feels dry and even a bit grainy. Again, Honeycrisp seems to have extraordinarily long-lasting lamellae (Tong et al. 1999). We always love an excuse to run experiments in the kitchen, and Honeycrisp presents one. The middle lamella is made of pectin, and as Jeanne describes near the end of her Vaccinium post, overripe fruit sometimes fails to gel, probably because the pectin has broken down. It would be interesting to compare the gelling capacity of Honeycrisp to that of other varieties whose lamellae are not as resistant. Let us know if you try it. How do Honeycrisp apples taste? Their sugar is well-balanced by some tangy acid, but I haven’t spent enough time with this variety to have a vocabulary for it. Beyond the sweet-tart balance, apple flavors can be extraordinarily complex, with both tropical flavors and notes from other members of the rose family (peach, almond, rose, cherry). Flavors and aromas change with storage and growing conditions. As anyone who has tasted wine can tell you, your own mood and your companions’ suggestions strongly influence your ability to name what you taste. John Seabrook describes the origins and qualities of the Honeycrisp and its offspring SweeTango ® in a fabulous New Yorker piece, and I’m still not sure what to think of them. I’m just happy that there are now so many varieties to choose from, and that between August and February I can pretty much buy what I like. Arctic ® apples are not crisper or more refreshing than other varieties – just eternally whiter. They are also shaping up to be far more controversial, and if you haven’t heard about them yet, you will. Arctic ® Goldens and Arctic ® Grannies were derived from familiar old Golden Delicious and Granny Smith varieties using a very hot new method for modifying gene expression called RNA interference. I’ll explain how that works below. This spring (2015), the USDA determined that the new varieties are not plant pests in need of special regulation, and the FDA concluded that the fruits raise no food safety concerns. With last month’s approval by Canadian regulatory boards, Arctic apples may now go into commercial production and be sold for human consumption in the US and Canada. We could see them in a few years once trees mature and start producing fruit. When you cut or bite into an apple, it slowly starts to turn brown, and some people can’t quite get over that. But the color has nothing to do with the apple’s freshness, only its storage temperature and the time it has been exposed to oxygen. You might even say that the apple is showing off its stress-induced tan, since one of the brown pigments produced is melanin. In apples and other fruits, the pigment doesn’t protect the plant from UV rays, but it does seem to interfere with insects’ digestion and may deter further damage. Enzymatic browning begins when cells are damaged (bitten or cut) and small phenolic compounds sequestered in one part of the cell (the vacuole) are liberated. The phenols are then free to react with enzymes called PPOs (polyphenol oxidases) which link them together into larger molecules that go on to form the dark colored polyphenols that insects and some people find objectionable. This pink pearl apple is pink all the way through. That’s one solution to browning. You hardly notice the totally natural browning reaction if you eat your apples promptly and completely. But all across North America it is allegedly a big problem, and Okanagan Specialty Fruits, Inc. have a solution: two new “Arctic ®” apple varieties whose genes endow them with everlasting snow-white flesh. The scientists at Okanagan argue that if apples won’t brown then there is no need to treat them with sour-tasting acid or to throw out slightly tanned abandoned fruit. Pre-cut apples are a surprisingly big business. The three dominant hamburger chains offer apple slices in their kids menus, lots of restaurants offer them on food bars, and grocery chains sell bags of pre-sliced apples for home use. Thus an apple variety that always looks freshly cut could give its producers a huge stake in the growing market for nutritious convenience foods. I say “could” because Arctic Goldens and Arctic Grannies are genetically modified organisms, and not all consumers are open to eating GMOs. Even consumers who love the idea of Arctic apples might not be able to buy them if their main supply of fresh apples comes from the drive-through. That’s because McDonalds could reject Arctics the way they rejected GMO potatoes, produced using similar technology (as reported by several reliable news outlets last fall). On the other hand, consumers are likely to hear the claim that Arctic apples are different from other GMOs in a way that makes them more acceptable, and if that claim sticks, Arctics could enjoy an easy entry into the mainstream food system. For example, the method for creating Arctic apples involves a clever use of the apples’ own genes and quality-control mechanisms. Unlike the modifications that produce Bt corn and Roundup Ready soy, the non-browning trait involves no “foreign” genes or novel proteins that might end up in food. (Well, there is that marker gene and presumably present but undetectable levels of its protein product.) Arctic apples also probably entail fewer ecological risks than current GMO crops. Since Arctics do not produce a pesticide (like Bt) or resist an herbicide (like Roundup) they shouldn’t promote insect resistance or problem weeds. 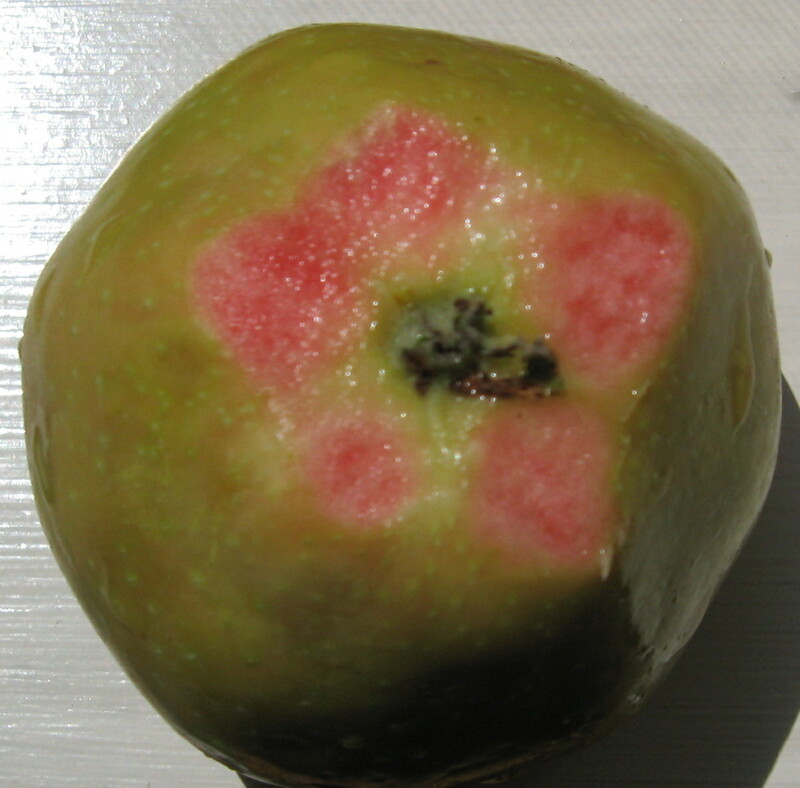 Moreover, since apples are propagated through cuttings, not seeds, they are very unlikely to spread genes to neighboring orchards in a way that endangers other producers’ non-GMO status. Whatever your view of this application or of GMOs more generally, it’s fair to note that Okanagan has been unusually transparent about its GM technology, and their researchers have written many pages explaining the science to a broad public. Without their openness, I would not know which of several possible techniques they used and therefore which to explain here. For further exploration of the ecological issues, see Bettenhausen, 2013. One increasingly popular way to keep a protein from being made is to leave the normal gene intact but to silence it by killing its messenger RNA. Researchers do this by manipulating a fundamental control mechanism used by plants, animals, fungi, and essentially all eukaryotes: RNA interference (or RNAi). In nature, there are various reasons that a cell might want to stop an RNA message from being translated into a protein, and there are various versions of RNA interference. In some cases, RNAi protects the organism from certain viral infections (e.g. polio) that depend on host cells to reproduce double-stranded viral RNA. In other cases, cells target their own RNA as a way to stop gene expression after the DNA has already sent out its message. In both situations, the cell deploys a complex of interconnected proteins to search and destroy RNA messengers carrying specific bits of code. Oddly enough, a gene can be silenced by introducing an additional copy of it into the chromosome. With this technique, the extra copy is simply a much shorter version of the original gene. Arctic apples carry at least one extra shortened copy of each of its own native PPO genes. When the cell tries to make an RNA messenger from these short copies, the messenger doubles back and sticks to itself, forming a hairpin loop. The cell recognizes that something has gone wrong with this message and deploys the RNAi system to destroy any messages that look similar. 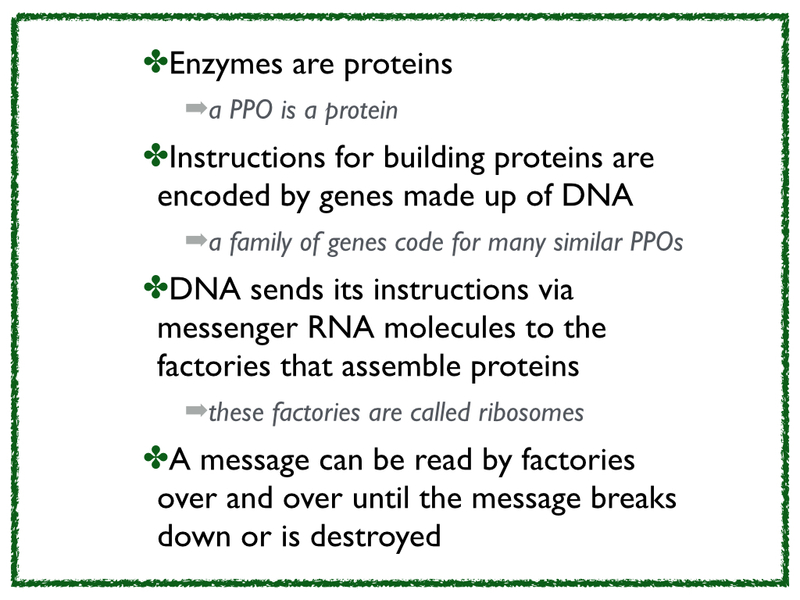 The normal RNA messages from the normal PPO genes get caught up in the search and are likewise destroyed. (Like when Hamlet kills Polonius after he makes a Claudius-like noise behind the curtain…) No messages mean that none of the targeted PPO enzymes are made and no pesky browning will occur. Opal lost its luster as a girls’ name towards the end of the Second World War, but despite its old-fashioned connotations, the Opal® has become a much sought-after apple. Opals, like Arctics, stay white for a long time thanks to their low levels of polyphenol oxidases (PPOs). The big difference, which is heavily advertised, is that they are conventional hybrids, not genetically modified. The Opal® website makes very clear that “they are the first U.S. apple variety to be verified by the Non-GMO Project, the only independent verification in North America for non-GMO food.” Until Arctics are available in stores, there are no GM apples for sale anywhere, but it’s obvious why Opal would want to clear up any confusion before Arctics hit the market. And it’s not only the non-browning insides that are similar. Since Opals are derived in part from Golden Delicious (crossed with Topaz), they strongly resemble Arctic Goldens in having rich amber-toned skin. One difference is that Opals have a bit of russeting (rough brown surface markings) around their stems. Interestingly, Opals have not already pre-empted Arctics in the pre-cut apple market. They seem to be sold primarily as whole fruits directly to consumers, perhaps because of their limited supply. Although they were developed about 15 years ago in Europe (the Czech Republic) Opals have been available in the U.S. only about 5 years, and they are supplied by a single licensed grower in Washington State. They are available for just a few months of the year. I have never tried one, but I’m keeping my eyes out for them. Eventually it will be fun to compare them to Arctic Goldens. 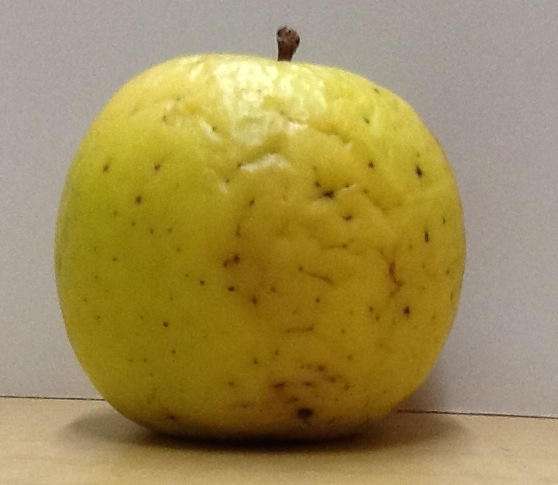 The last apple of the season, stored for 6 weeks, has lost its turgor. I ate it anyway. It tasted amazing. My favorite apple supplier closed his stand in mid-February this year. I stocked up, but this week I ate the last apple from my stash. It was as old and wrinkly as Polonius, and slightly rubbery, but the concentrated flavor was amazing. Exeunt. Constabel, C.P., et al. (1996) Polyphenol oxidase as a component of the inducible defense response in tomato against herbivores. Ch. 9 in Romeo et al. (eds) Phytochemical Diversity and Redundancy in Ecological lnteractions. Plenum Press, New York. This entry was posted in Flavor, Fruit, The basics and tagged apples, cell structure, fruit, fruit structure, Katherine Preston. Bookmark the permalink. Thanks for your note, and thanks for pointing me to your student’s project. I tried to leave a comment but it got blocked as spam. Basically, I just wanted to say how interesting the project seemed. Very cool! As something of an apple snob every variety is compared to a northern spy, crispy, crunchy, long-storing, sweet-tart with complex fruity tastes, everything you expect I’m Apple and seldom get. Katherine, I enjoyed reading your comparison of apple varieties, modifications to prevent browning, and other information from several years ago. I chanced on your article while researching the differences between Cripps Pink; Pink Pearl; and Pink Lady varieties. I am a member of Calif. Rare Fruit Growers Assn., and have enjoyed growing fruits and nuts in San Diego County for many years. We try to push the limits of what we can grow primarily organically, and without the use of pesticides, and I try not to use much fertilizer. Recently we have been considering the actual requirements of chill hours in relation to the production of apples; and are finding that many apple cultivars do not require as many hours of chill time as was previously thought. Kevin Hauser in Riverside has hundreds of varieties that have produced quite well in his area. He has a link at “GROWING APPLES IN THE CITY” and Dave Wilson Nursery (Tom Spellman) is starting to do research in conjunction with this. Thank you for your research and being willing to publish your findings for the benefit of others. It is refreshing to find people that are willing to share their findings. Thanks for reading, David. I’m a fan of pink pearls myself! They are fascinating to look at (translucent skin over pink flesh), and although they aren’t the best apple for eating out of hand, I love them dried in oatmeal. It’s wonderful to have so many choices these days!